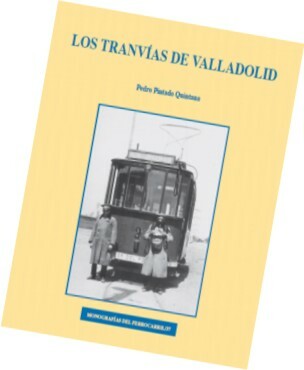 The book of trams Valladolid tell us the birth, evolution and end of the urban tram network in the Castilian city. From 1871-1881, when finally the first line of animal traction was inaugurated some projects that did not pass the paper and some that materialized with many problems until the Catalan businessman Eduardo Barral acquired the concession and launched the line between presented Railroad Station North Company and Plaza San Pablo. With a precarious operation and low maintenance, Barral said line remained until 1899 when a Belgian company bought the concession and began to make improvements in the material and the horses and the facilities for new lines were built and a garage suitable network that was being created. Also they foresaw the Belgian electrification of the network but when they were about to achieve this, the Spanish business group headed by Basilio Paraiso and Santiago Alba bought the company and obtained all permits for change of traction, blood supply and in 1910 They circulated first electric trams by Valladolid streets. The following year was completely electrified network and reached its maximum extension. The company owns several extensions designed to nearby towns that did not bear fruit and the dictatorship of Primo de Rivera got in trouble a business which became unremunerative. The implementation of the first buses in the twenties of the last century, was another factor complicating the already difficult economic situation of trams Valladolid and when the City Council granted the concession of the regular buses to the SATA company 1932, the die was cast. Finally in 1933 the company ceased operation due to the impossibility to cope with the deficit it increased each month. The story continued in 1936, after the coup against the Republic, as the coup leaders used the trams garages to enclose them loyal to the government. The material of the trams Valladolid was bought by the Society of Trams Gijon, which took the cars to the roads network and sold them to a Bilbao businessman although lifting them lasted for several years. In 1951 he ended the story when the mayor decreed that all avenues had been raised and restored pavement. Size: 22 X 20 X 1,5 cm.